Digital information is the lifeblood of every enterprise business. You need content services that integrate with your existing on premise and Cloud technologies to ingest your content and store that information in accessible pieces so it can be found, managed and viewed across the globe in real time. 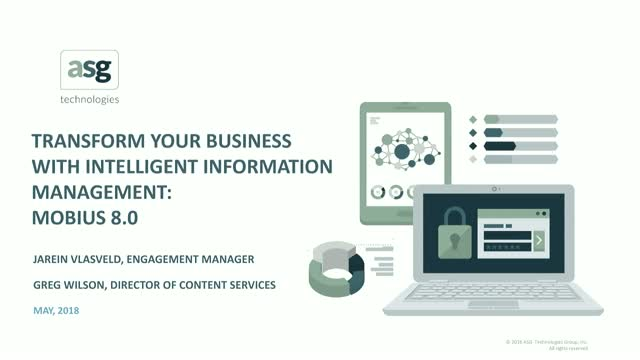 Watch this webinar to hear ASG’s Product and Solutions Consulting team discuss how the powerful content services offered by Mobius can help transform the way you do business and access information. During this 30 minute webinar, you’ll explore the granular policy management that lies at the foundation of Mobius’ architecture and see how Mobius allows your teams to manage content easily through regulations and corporate policies while ensuring your business remains competitive.